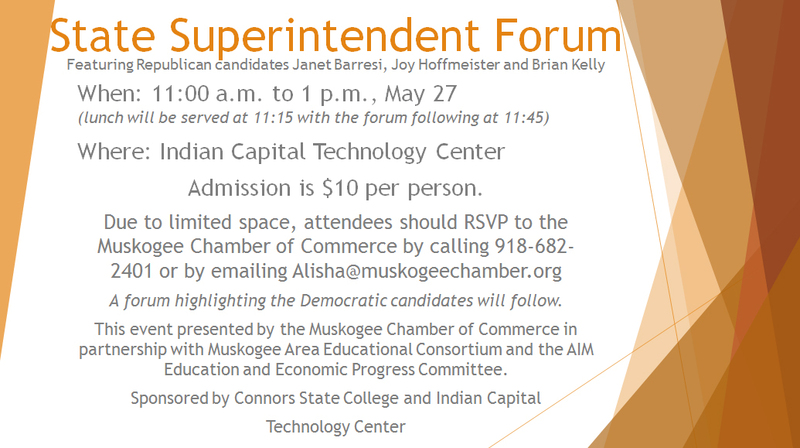 The Muskogee Chamber of Commerce has partnered with the Muskogee Area Educational Consortium and the Action in Muskogee Education and Economic Progress Committee to present the Candidates Forum for the State Superintendent race. 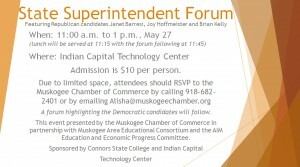 The forum is from 11 a.m. to 1 p.m., May 27, at Indian Capital Technology Center, 2403 N. 41st St. E.
Doors will open at 11 a.m., with lunch served at 11:15 a.m. and the forum following at 11:45 a.m. This forum, sponsored by Connors State College and Indian Capital Technology Center, will be limited to the three candidates on the Republican ballot in the primary election � Janet Barresi, Joy Hoffmeister and Brian Kelly. A forum highlighting the Democratic candidates will follow at a later date. Admission is $10 per person. Because of limited space, attendees should RVSP to the Muskogee Chamber of Commerce: (918) 682-2401 or email Alisha@muskogeechamber.org.